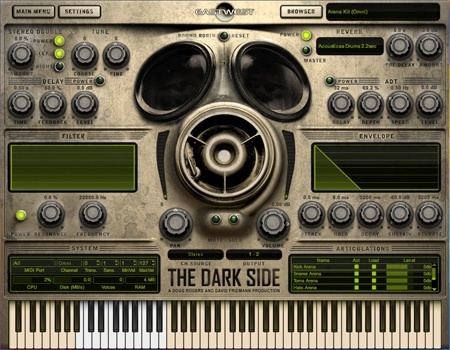 New Eastwest virtual instrument "The Dark Side"
Eastwest releases "The Dark Side" virtual instrument. It is not really a fresh news however, I haven't taken enough time to talk about the new Eastwest virtual instrument called "The Dark Side" released this summer. IMO this virtual instrument seems to be dedicated to music composers, sound designers mostly & ambient / weird / indus dark music makers. As usual, I think I'm gonna buy it... whereas I haven't played with it yet. I've only listened to the demos, and I think it could perfectly complete my music arsenal; particularly with the miscellaneous instruments section. You can check the audio demos here and see for yourself if you want to try this new powerful tool. "mass aural destruction was the name of the game"
From the soundonline website about "The Dark Side" virtual instrument. Created and produced by Doug Rogers (EastWest) and David Fridmann (MGMT, The Flaming Lips etc. ), THE DARK SIDE is the first of its kind: an unconventional, hip and exciting collection of virtual instruments, some dark and eerie, and some which have been purposelyand skillfully!mangled, distorted, or effected out of all recognition. To produce THE DARK SIDE, Rogers partnered with Grammy Award-Winning record producer David Fridmann, whose unconventional (and successful) work with the likes of MGMT, The Flaming Lips, Weezer, Mercury Rev, Saxon Shore, Ammonia, Ed Harcourt, Sparklehorse, Café Tacuba, Elf Power, Mogwai, Thursday, The Delgados, Low, Phantom Planet, Gemma Hayes, Goldrush, Tapes ’n Tapes, Hopewell, Black Moth Super Rainbow, Number Girl, Zazen Boys, Sleater-Kinney, Clap Your Hands Say Yeah, OK Go, and Tame Impala etc. he had long admired. "THE DARK SIDE idea came to me when I was mentoring a young alternative group about some demos they sent me. To my ears, the tracks didn’t sound tough enough for their intended market, so I told them they needed to toughen up their sound,” said Doug Rogers, Award-Winning Producer at EASTWEST. “I looked around for sounds that could accomplish this and found absolutely nothing, even in our own vast collection. I saw this huge, gaping hole in the market that needed to be filled. Then and there, I decided to make it my next project after my recent pristine orchestral productions, a complete aural turn-around." Rogers partnered with Grammy Award-Winning record producer David Fridmann. Fridmann’s “no rules” style of production was exactly what Rogers was looking for to help produce THE DARK SIDE instruments. More about "The Dark Side" virtual instrument ? Go from "The Dark Side" new virtual instrument to Music Composition ?